Visual flow indicators with window and external return “W” are flow indicators for the visual control of liquids in industrial processes and for the external mechanical detection of very dirty liquids. They are produced in different materials, with a free-flow mobile blade pointer. The connections can be threaded axial or flanged. Maximal thermal endurance with sealing NBR is up to 100 °C, with teflon sealing up to 250 °C. 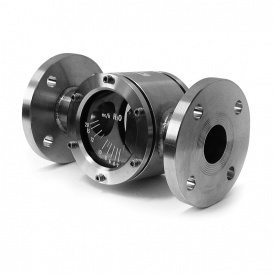 Flowmeters can be mounted on the horizontal pipe only. 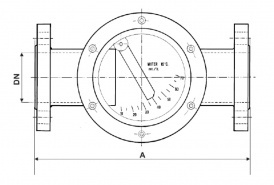 On request, flowmeters can be produced for PN16, PN25, PN40. Maximal thermal endurance: 250 °C. Maximal working pressure: 10 bar, PN16, PN25, PN40.